Straighten it Out! Do you recognize this Designer Series Paper in the background of my card? If you know me, then you already know I’ve straightened out the diagonal lines found in Lullaby Designer Series Paper. With the solid band across the middle of the card, the lines in this beautiful paper look so much more striking horizontal. It Fits! 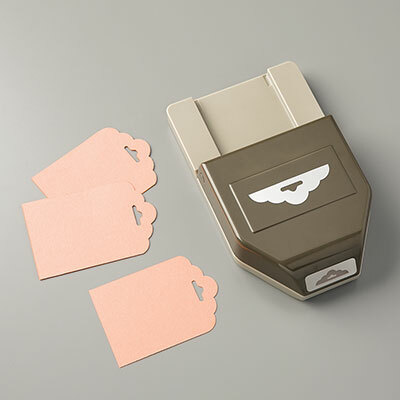 A couple of weeks ago, I shared a card that paired the Note Tag punch with the Scalloped Tag Topper punch. 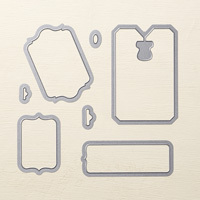 This card pairs one of the Chalk Talk Framelits with the same tag topper punch. I love the versatility of both tag topper punches, so it’s fun to play around with how the shapes work with other shapes. Layering is fun. Weighty Triplets. Three candy dots always make me happy. Three leaves in a tiny cluster make me smile, too. On the face of this card, I believe the candy dots carry just as much weight at the three leaves, helping to balance the card perfectly. Why? I’m no design scientist, but I think it’s because the dots are presented on a white space, while the leaves are shown on a striped, more visually distorted space. I hope that makes sense – I also hope it’s right. Either way, I like the way these triplets help to balance this card. Yippee! Thanks for stopping by today! I hope you enjoyed this project. Hi Brian. As much as I love Blackberry Bliss, I am glad it played a supporting role on your card. It makes sense, given the color scheme and layout. I no design scientist either but I also think the balance is achieved by the candy dots because they appear to be heavier than the leaves and therefore they can balance out the weight of the card perfectly. Does that make sense? I hope you have a great day! I think this sentiment is so neat ! The same goes for your card . And those cute leaves add so much to keep all the lines from looking too tailored . Now I will go and look at that DSP to see what you did with your smart self !! Just love everything about this card. The lines and the layers look great. Love the three same colored dots . . . I probably would have put one of each, but I think that would have been too much. Playing catch up yet again! As always Brian, your card is just absolutely fabulous! Shaking my head with admiration, Very nice! Beautiful card Brian. I think that Blackberry Bliss, Always Artichoke and Cajun Craze work really well to bring that pop of color in this card. Baked Brown Sugar provides a fantastic backdrop for your card. Great job Brian. Although summer isn’t officially over yet, I’m loving the cool crisp days we’re having in my little part of Ohio. Loving the crisp straight lines of the DSP. The leaves seem to be playfully floating to the ground. A very well balanced card. I’m also puzzled as to how you cut this DSP to make it look like that, you are so darn clever!!! Your card is beautiful, so clean cut and elegant. This amazing season of the year is perfectly represented in this awesome Brian King original. Great Thanksgiving card, Brian! I agree, your three dots and three leaves balance each other perfectly. They really work perfectly together. Thanks for joining us at The Paper Players. This sentiment just cracks me up! 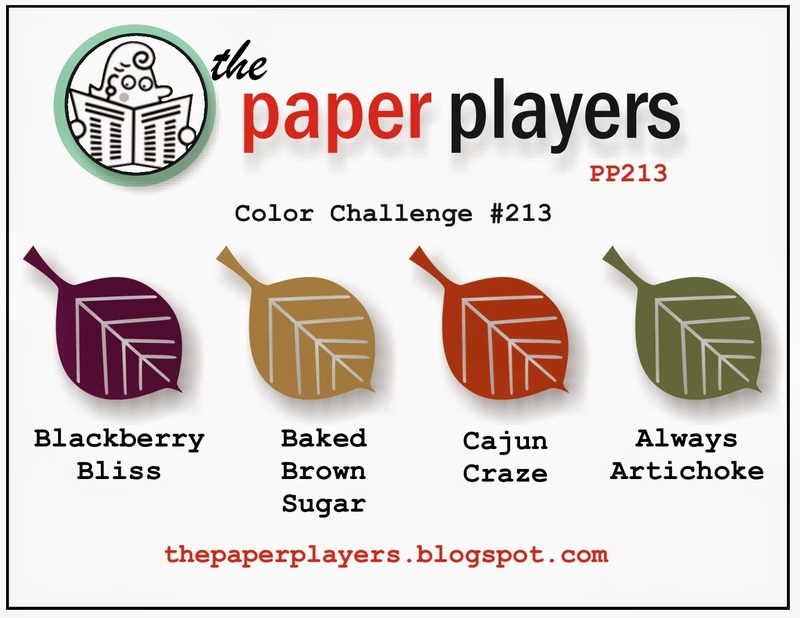 What a great way to use the colors…I just love your trio of leaves! Thanks for sharing this! Another great card, Brian. I love the horizontal stripes and the three leaves in the corner balanced by the three candy dots. So glad you join us at the Paper Players. Another ‘Brian special’ with the realigned DSP – this is becoming a trademark! Love the balance of colours on your card; thanks for joining us over at the paper players this week!